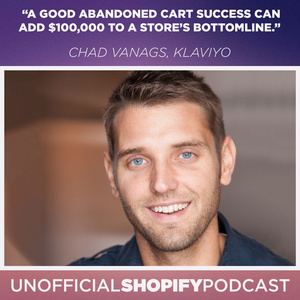 Klaviyo's Chad Vanags joins us to explain just how easy it's become to use data-driven personalization in your email marketing to make more money on autopilot. He breaks down what email flows consistently make the most money, and what the best practices to use when implementing those workflows. Currently the head of agency training at Klaviyo, Chad teaches how to successfully implement email flows for immediate success. Previously, he was the co-founder of the agency Ecommerce Influence where he worked with brands like MVMT Watches, Tipsy Elves, Stance Socks, Blenders Eyewear, and many more. He was also the producer and co-host of the Ecommerce Influence podcast.